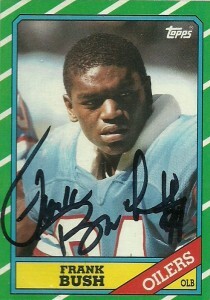 Linebacker Frank Bush was a 5th round choice of the Oilers in 1985. He played admirably in his rookie season and was named to numerous all-rookie teams. Unfortunately in 1986 Bush would be diagnosed with a narrow spinal canal- a career ending prognosis. The Oilers would immediately bring him onboard with their coaching staff starting as a scout where he’d stay on board through 1994. In 1995 he moved to the Denver Broncos- winning two Super Bowl rings serving in a variety of capacities for the team including linebackers coach, and secondary coach. Bush would stay there through 2003, leaving to coach linebackers and be assistant coach to Dennis Green in Arizona. The Texans new coach in 2005, Gary Kubiak wanted to bring Bush on board as his defensive coordinator, but was unable to wrest him from the Cardinals staff. Bush would be hired by the Texans in 2007 and serve initially as a defensive assistant under Richard Smith. With Smith relieved of his coaching duties in 2008, Frank would get his chance at defensive coordinator. That season the team would blitz aggressively and the defensive unit would improve steadily through the season against the run and pass after an incredibly rough start. 2010 would not be so fortunate. Starting an extremely young secondary the team would give up 24 points in 14 of 16 games, allowing opposing quarterbacks post over a 100 average QB rating. The team would finish a disappointing 6-10 and Bush would be relieved of his job. He wouldn’t be out of a job long and caught on quickly with the Tennessee Titans where in 2011 he is now serving as their linebackers coach.